Thanks to artists like Banksy and Obey, street art is getting bigger and more respected within the art world. The tag, the artists signature, is where graffiti started and TagsAndThrows seeks to shine light on this part of the subculture, an art form soon to be as respected as any other. Bombing With Uzi is TagsAndThrows 6th short documentary. 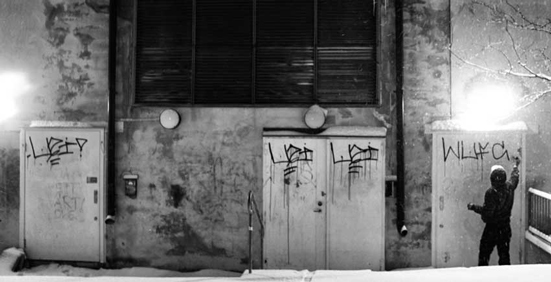 The viewer gets an unique view of how one of Europe’s most legendary graffiti writers – Uzi – gets his name up on the streets of Stockholm, Sweden, while balancing his role as a family father in the meanwhile. Interviewed about his view on art in public spaces, the cost of graffiti removal and the future of graffiti within the art world. TagsAndThrows is the worlds leading online source when it comes to the backbone of graffiti – tags and throw-ups. Our main market is the die hard fans of graffiti bombing – the ones already in love with the subculture, but we’re also aiming at educating the rest of the world about this suburban phenomenon. With 88.000 followers on Instagram and 1.6 million views on YouTube on 6 short documentaries about graffiti bombers from New York, Stockholm, Melbourne and Copenhagen – TagsAndThrows is set to document the most beautiful tags and throw-ups in the world in the most beautiful way possible. Thomas Gunnarsson, or OKOK as he calls himself as an artist, has been a part of the graffiti culture for more than 27 years. He’s a photographer, a filmer and a designer – and a shaker and mover in the Swedish creative industries. Right now, he’s putting his full focus into TagsAndThrows and his own career as an artist – creating art, experimenting with never-before used techniques, and expanding the universe one sketch at a time. “I love bombing and I love photography. I snap a lot of pictures. Pictures of people, patterns and color combinations, tags and throw-ups. I love to capture the world around me, both with a camera, visually with a pen or with words on paper. It’s something inside me that I can’t stop. Something that’s gotta get out”. – OKOK, founder of TagsAndThrows, covered on the BizarreBeyondBelief Magazine.